Died December 6, 1917, in England, of war wounds. Albert joined the Baptist Church when he was about 15 while working for Leslie Armstrong--against his mother's wishes. (Their father had requested that all the children be brought up Methodist just before he died.) At about 16, he went to Manitoba and enlisted in the Canadian Army. While picking up wounded soldiers in France during World War I, he was struck by shrapnel in the chest, and was paralyzed from the chest down. He would write letters lying on his back. He talked of wanting to come home. The government offered to pay for his mother to go to England to visit him before he died, but she declined. She had sprained her ankle on board ship going to Canada when she was 13. 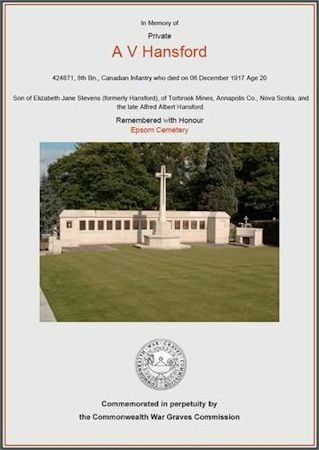 He wasn't allowed to go home, and he died and was buried at Epsom, England.